Finally the beauty package has arrived. I'm a little bit worried at the first place I order this stuffs from strawberry net. I saw the price list in IDR so I have a mind that they have a base in Jakarta or at least in Indonesia. Until I do checkout and tadaaa they only accept cc or paypal. After finishing my payment I'm still worried and looking for people's opinion about the shipping and tax to my town. However after 7 days of worries I met them on a white box tie with a purple bow. 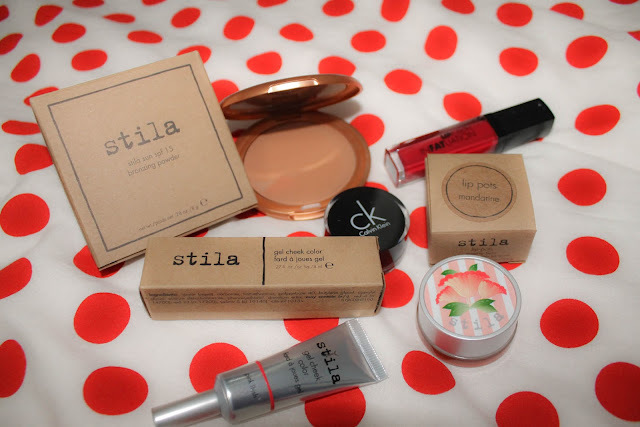 When I order this 3 items of stila, I know that they have a promotion for a new member and I choose LIP FAT lip tint in screen siren as a compliment. But they also give me Calvin Klein eyeliner gel in cocoa edge color. I recommended this site not because they give me a few compliment but this is one of the best beauty site that sell so many beauty products, from stila till SK II. They also provide free shipping to my town and having a huge sale in this month. Have a plan to buying something from sasa.com but still searching some review about that site, I know it's the best but need to make sure that they provide shipping an item to my town.